Little boy, I love the way your mind works. Most of the time it makes me laugh, some of the time it makes me crazy, but all of the time, I love hearing what you think. The other day we had a snake in our yard. Thankfully it was just a little two foot long non-poisonous little bugger, but it was a snake no less. After giving you the fear of God speech on why we never, ever touch snakes, run away, etc., I got a broom and chased him off. We came inside and you told Daddy all about it. Ian: Daddy, there was a snake in the yard. Daddy: Really? What happened to it. Ian: Mommy chased it with a broom. Daddy: And did he run away? Ian: Well he didn't have any legs, so he didn't run. But he go-ed. I love how literal you are. Ian: *after sitting quietly in the car for a bit, and while I was coming to a stop at a traffic light: MOMMY!!! A JET SKI!! Mommy: *after recovering from the heart attack you gave me with your outburst: Where?! Mommy: I dont see one, Bear. I see a truck and a car and a trailer, but no jet ski. Ian: *with disdain: No, Mom. In the sky right there. See that cloud? And then there's this gem. Again, I love how your mind works. You, Daddy and I were driving and stopped at a light. We were sitting right next to a wedding dress shop, and I was commenting on how pretty the dresses were. You looked over and described them to me. I've included a picture so it would make a little more sense... Sorry it's kind of small and far away, but here goes. 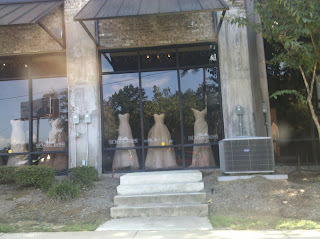 Ian: That dress in the middle looks like a heart, Mommy. See it? Mommy: Yes, I do see it, Buddy, and it does look like a heart. Ian. That dress next to it looks like a kangaroo. See his ears? This cracked me up. I guess it does sorta look like a kangaroo. Sadly, this means I will probably never get to wear a dress with off-the-shoulder sleeves like this, because it will forever remind me that I look like I'm wearing a kangaroo. I never know what is going to come out of your mouth next. On one hand, this just thrills me. I get a different, honest and innocent perspective on the world. But then on the other hand, it just terrifies me that I never know what you're about to say. Or to whom you are going to say it. We gotta start working on your inner-monologue-filter. Need to make sure some things stay in eventually. But for now, keep 'em coming, Buddy. Your thoughts just make my day.